OMG it’s cold! Yes, even in LA the overnight temperature can dip down into the 30’s in December, so with no furnace I ran out and bought 2 more space heaters, 4 total. We bundle up as if camping. If you’re thinking about remodeling while living in the house, consider this a reality check. Be prepared for anything, any inconvenience that is. We’ve had power outages, no heat, occasionally no hot water, no water, no phone, no internet (oh the horror), a lot of loud noise (from equipment and the crew), and cramped living conditions. All of which we patiently endure knowing that 2 months from now we’ll have a new Master Suite and our 60 year old bungalow will have a few more modern amenities including a heated tile floor in the bathroom. 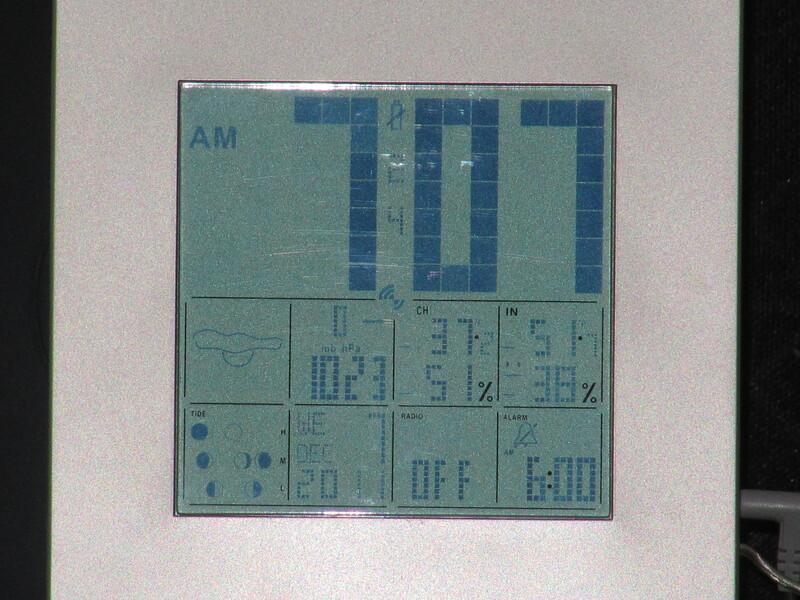 Here our indoor/outdoor weather clock shows it’s 37 degrees outside and 51 degrees indoors at 7am. 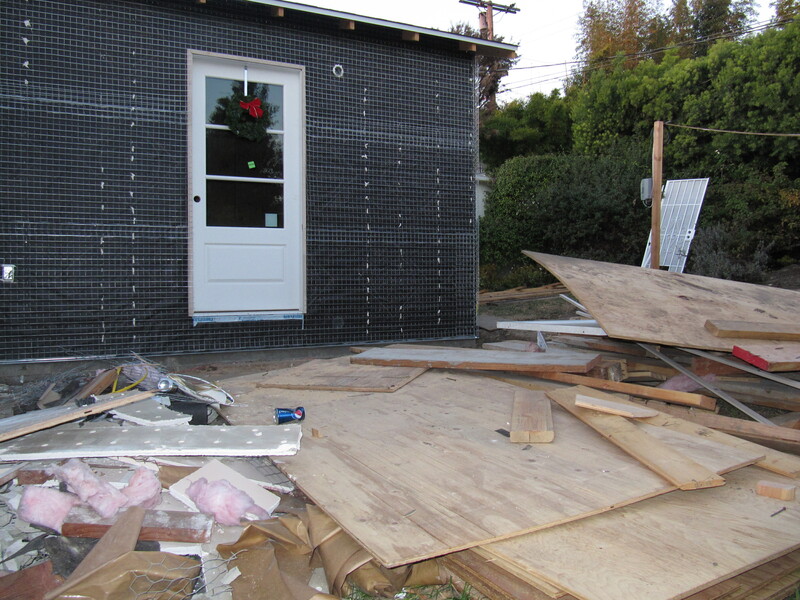 OUR KITCHEN – Behind this plywood is the addition. The window was removed. The blue painters tape is where the wall cracked during the demolition of the mudroom behind this wall. 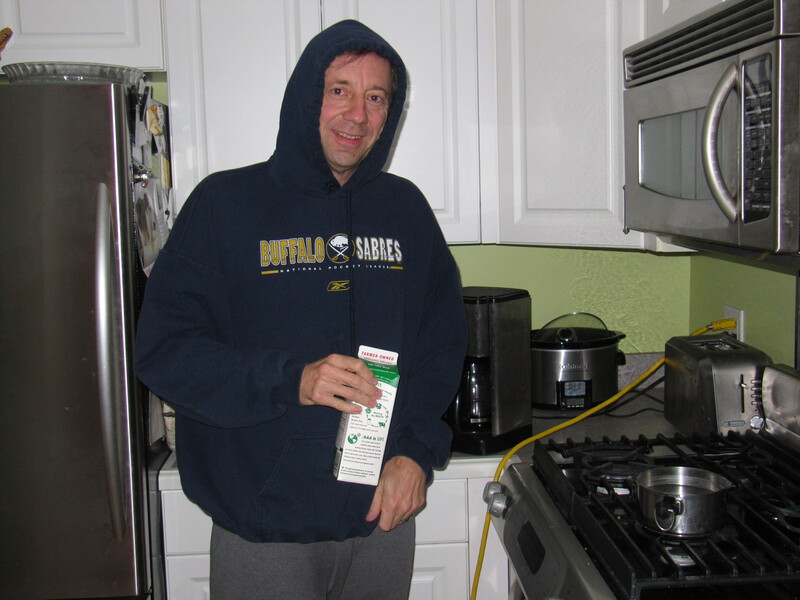 Notice the extension cords running through the kitchen? That’s so the crew has access to power. Remodeling is like camping at home. 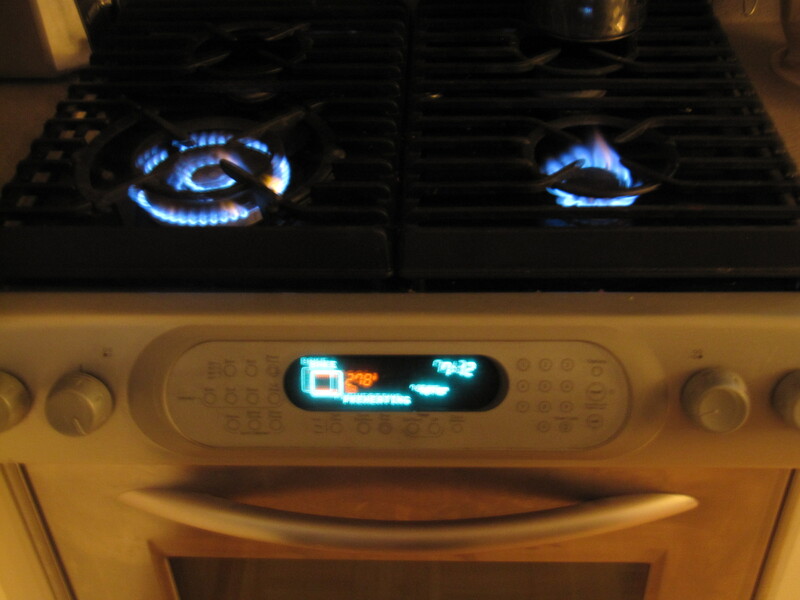 <Is the stove smiling? Get some marshmallows to toast! 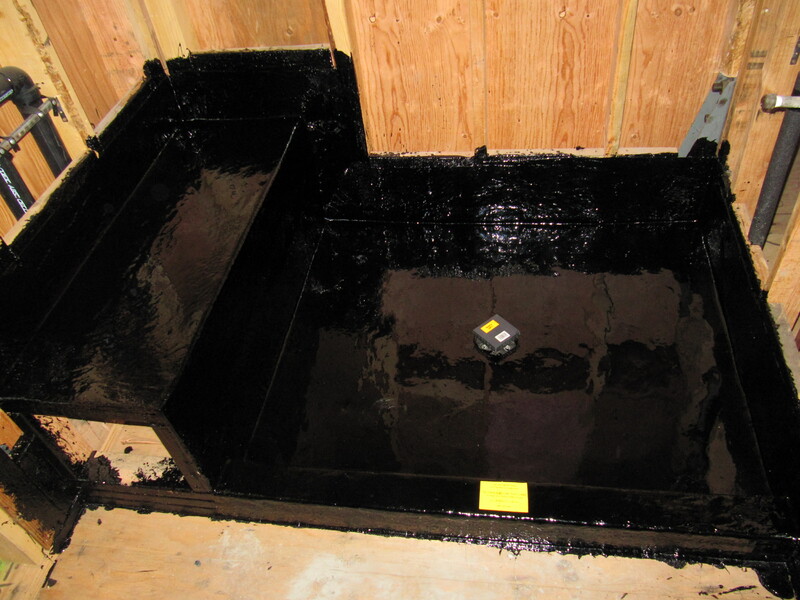 The work completed during the 9th week, December 5 – 11, include hot mopping the shower floor and bench. If you’ve ever smelled a nearby roof being tarred, that’s what this is. 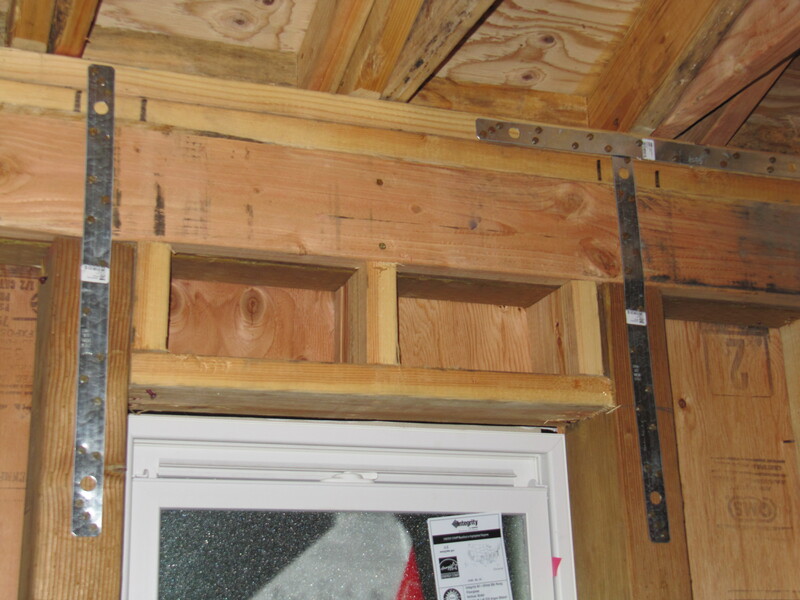 The metal straps of various sizes and thickness are strategically placed to hold the structure together during an earthquake. EXTERIOR WRAP & WIRE – Unlike the East Coast where houses are either brick or some type of siding (vinyl, aluminum or cement fiber board), houses on the West Coast are predominantly covered with cement stucco. It is a time consuming process with many steps that begins with wrapping the exterior walls with a weather barrier the same as any other siding. 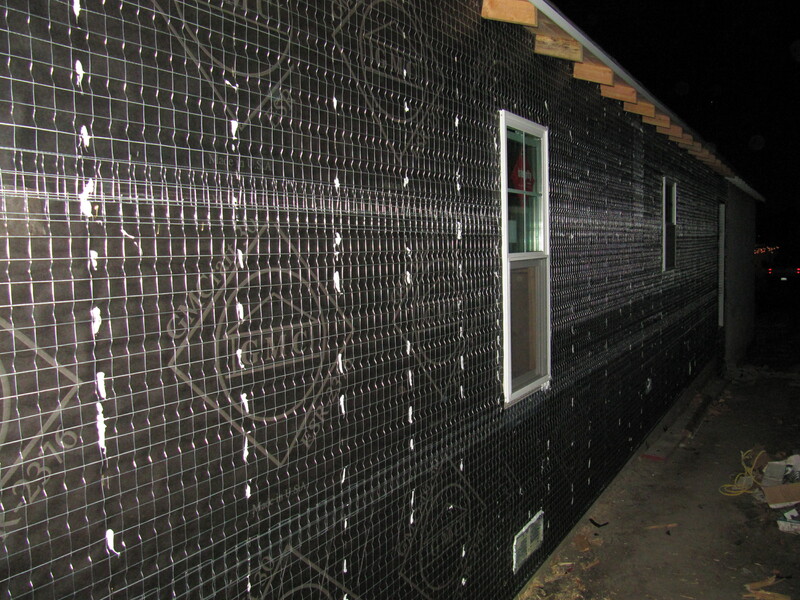 But then the next step is to nail wire over the entire exterior, which holds the stucco. Ignore that pile of trash. Another beautiful sunset. I’ll call it a day. Plenty more to do in the AM.